Jag arbetar numera oftast förenklat med tre vågräta fält i skilda färger. Färgerna är fria, men åskådaren kan uppleva färgfälten som ett landskap. Detta är nog bland annat för att ögat söker en mening med det vi ser. Det är inte en bild av ett landskap, men det uppfattas som om det vore det. För mig har detta blivit intressant på så sätt att jag fritt kan skapa en bild utan att fastna i själva föreställandet. Jag kan använda ganska fria färger och de upplevs ändå tillsammans som ett landskap. Jag kan koncentrera mig på själva färgen och förhållandet mellan ytorna. Åskådaren får själv tolka bilden. Nowadays I most often work in a simplified manner with three horizontal areas in different colours. There may be any colours but the beholder may experience the areas to look like a landscape. It’s probably because the eye seeks a meaning in what we see. It’s not really a picture of a landscape but it will be interpreted as such. For me this has become interesting because I can freely create a picture without getting stuck in what it’s supposed to depict. I can use relatively free colours and they will still be interpreted as a landscape. I can concentrate on the colour itself and the relationship between the areas. It’s up to the beholder to interpret the picture. Back in time I was painting in a more depicting way, often landscapes and often painting them right there on the spot. It was a nice feeling to be sitting out there and feel and experience the landscape and the nature – colour, shape, temperature, scents. I saw animals being less afraid because I was sitting pretty still for quite some time in the same spot. But my way of working changed. The way of building a picture changed. Long after that I continued to go out in the landscape to paint. I did it even though I knew beforehand that I wouldn’t create a picture that I could approve of. Finally I had to come to the conclusion that I would no longer find my pictures confronting the landscape. I let go of that kind of locking regarding depicting. After periods of pictures of landscapes used up by mankind, with oil tanks, tank lorries, asphalt plants etc., I slid over towards more independent pictures originating from rust stains. After a period of pictures from details in a few paintings of battle scenes made by the Italian renaissance painter Paolo Ucello, I have been working with pictures with just a few colour areas for the last seven or eight years. The reduction down to three (sometimes more) coloured areas is a limitation in itself. But I have also gained a great freedom within that limitation. A freedom to start with any colour. And a freedom to continue with the colours I want to combine for the moment. 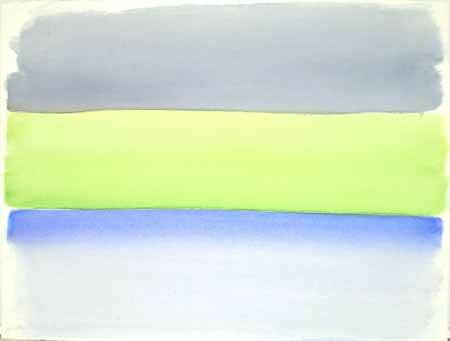 It’s been interesting to see how freely the colours can be combined and yet still be interpreted as a landscape. I can vary the impression with differences in colour and in the relative sizes of the areas or with varying the orientation between landscape and portrait. In my colour combinations I often seek out something calm, as a base for your thoughts to wander around. A point from which you can start seeking out associations. Actually, my pictures are much like an origin for travel inside you. A place for meditation. It’s probably been like that with the creation of the pictures as well. Back in time I was painting more actively, taking a few steps back and then right back with the paintbrush again. Now I mostly sit there watching, thinking and change or adjust a coloured field. Then some more watching, waiting and after a while, new adjustments. That doesn’t mean that the pictures are created rapidly – on the contrary. Mostly I have been over the same coloured field many times with small variations in colour. In time there might be something interesting in the interaction between different layers in the picture. You should be able to slightly notice something from different stage. It can absolutely not be something that feels straight and perfect. The picture shall – just as we humans – have it’s imperfections. It may very well be something annoying that the beholder wants to adjust. What’s perfect is not interesting. Above all I want the pictures to be a base for meditation or for the free associations of the mind.